Featuring a polished stainless steel case that’s 34 mm in diameter, this retro timepiece is perfect for the Dad, who likes smaller, dressier watches. The crystal is highly domed and made of acrylic to keep the cost down. 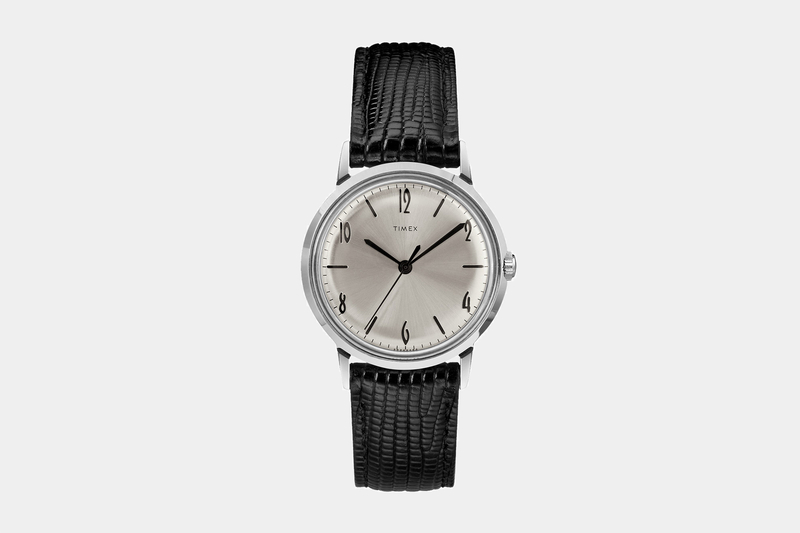 Despite the obvious cost-cutting, the material is actually period specific, as this is a based on an archival Timex watch that was introduced in the 1960s. Underneath the crystal is a curved sunburst silver dial, alternating indices and numerals marking the hours, thin Sword-shaped hour and minute hands, a baton-shaped second hand, and no date display. At just 10 mm in height, it should wear well under a cuff. Water-resistance is 30 meters and it comes with a black leather strap that’s embossed with an alligator pattern. The interlug width is 18 mm, so it can easily be swapped out with an array of different straps with ease. Inside is a hand-wound Chinese made mechanical movement. The watch is a classic and an incredible value. (Ref. TW2R47900ZV) Retail is $199.